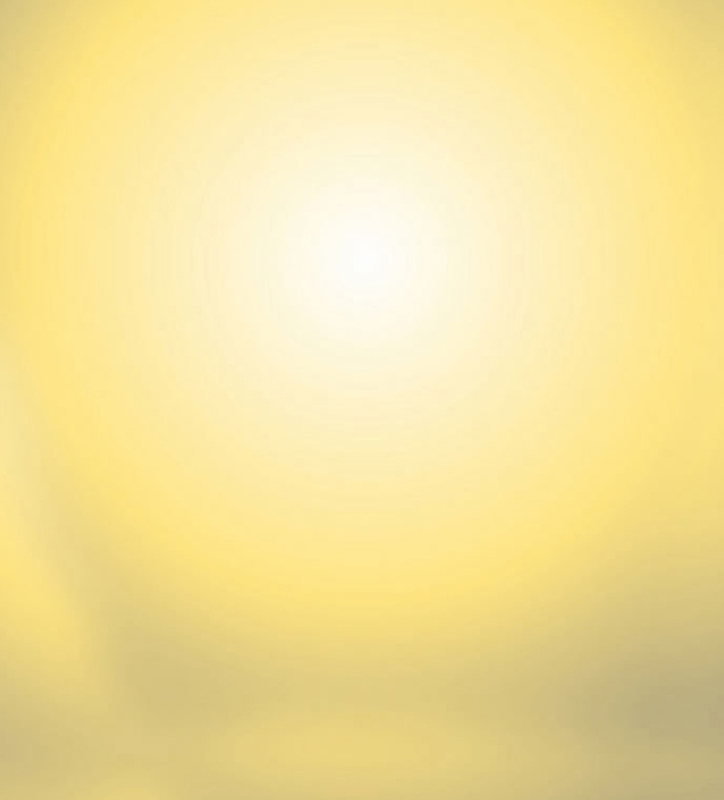 powerful testimony to human sophistication, maturity and spirituality. Indian percussion demands close attention to the development of technical skills. Therefore we prefer to teach it in private lessons (up to two hours). On request it is possible to learn in small groups – please don't hesitate to discuss the options with us. We play the pakhawaj, tabla and the traditional accompanying instruments of Indian percussion: the harmonium and the tampoura (Click on the picture to visit the shop). 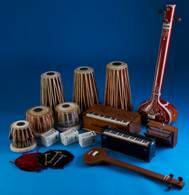 Instruments (Pakhawaj and tabla) are available - group size max. 4 participants. Many percussionists, drummers and rhythm enthusiasts may have dreamed of getting a good insight into Indian classical rhythms and percussion. These courses will give you the opportunity to immerse yourself in the ancient and celebrated drumming cultures of India. You will get to play the tabla and especially the barrel-shaped drum pakhawaj – the precursor to the tabla. Comprehensive course material will make it easier to learn these instru- ments and to get an in-depth view of the history, theory and techniques (the hand techniques are similar to those known to conga players) of Indian drumming. Experience yourself how this sophisticated drumming culture spans the entire spectrum of rhythmic possibilities! Please do not hesitate to give us a call or e-mail us for more information. Instruments (Pakhawaj and tabla) are available – group size max. 4 participants. We will work on a pakhawaj solo in order to learn and develop the art of soloing – its techniques, rhythm languages and rhythm patterns. We will also begin to explore the infinite worlds of ancient Indian compositions – some of the compositions are perfectly suited for the accompaniment of dhrupad singers. Starting with the fifth workshop, we will bring together singers and instrumentalists in order to practice the accompaniment of dhrupad and khayal! The workshops will be held in a small village located near Rennes, Brittany - Instruments are available. In the workshops, you will learn compositions suitable for solos, vocal and instrumental accompaniment. In order to practice accompaniment, arrangements have been made to work with a Dhrupad singer who resides in the village. This is a rare and excellent opportunity for percussionists to accompany a vocalist. We will also work on the structure of Pakhawaj solos, the talas, techniques, different rhythms and compositions. Over a course of 12 years in India, Joerg Kaufmann dedicated himself to the study of the ancient art of playing the pakhawaj and scholarly researched its history and theory. 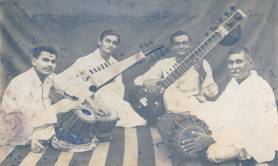 He learned from, and studied under, prominent Indian Pakhawaj players such as Pandit Arjun Sheshwal, Raja Chatrapathi Singh, Pandit Pannalal, Pandit Ramji Upadhyaya, Pandit Tribuon Upadhyaya, Mohan Shyam Sharma and others. 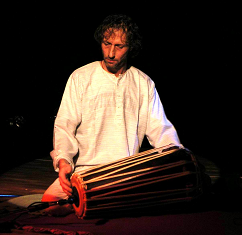 Today, Joerg Kaufmann is highly regarded for his knowledge and mastery of Indian percussion. In 2005, Joerg Kaufmann started his own school called PercussionArts, for African, Cuban and Indian rhythm and percussion. He also teaches throughout India and Europe. His method of teaching is systematic and highly professional combined with warm-heartedness, patience and humour and his performances are of highest virtuosity. It`s about micro-tones and micro-tuning, about micro-timing and Puls grounding. The vedic ways of understanding all possibilities in Sound and Rhythm are not only an impressive discovery and working- tool for Musicians - it`s also a great well of inspiration for Pedagogic, Therapy, Healing and Meditation, etc..
Dhrupad singing is the oldest and finest genre of North-Indian classical art music and its roots are believed to be in the temples of ancient Vedic times. 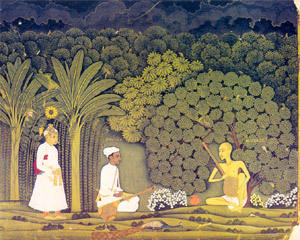 Also known as Nada-Yoga (Yoga of the sound), this majestic vocal art reached its contemporary form in the 15th century at the court of the Mughal emperor Akbar and has survived until today. Therefore dhrupad is a Janus-faced phenomenon: it is simultaneously musical and spiritual; it is simultaneously historical and transcendental. It is the source of the classical music of North-India and still feeds it until today. We will begin with fundamental singing exercises to develop our control over breathing and our voice. We will experiment with the main notes and notes "between" to get to know them and begin to develop a raga. Die folgenden Bols (Kompositionen) sind für Chautaal (12 Beats), können aber auch in anderen Talas gespielt werden, was durch gezieltes Umändern der Tihai erreicht wird.